Learn the basics of Testosterone Therapy, HGH, and other general health information. What are the symptoms of andropause or male Testosterone depletion? Yes, under the care of expert physicians who utilized advanced diagnostic testing and the latest medical research, Hormone Therapy is indeed safe. In fact, thousands of clinical studies have been conducted on the safety and efficacy of safe, responsibly administered Hormone Replacement Therapy. 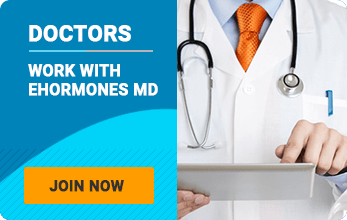 All Ehormones MD managed physicians are highly trained Medical Doctors, each specializing in the treatment of adults over the age of 30 who are experiencing hormone deficiencies/imbalances. What happens when the body starts producing less HGH? In children, HGH deficiency causes short stature and a delay in the onset of puberty. However, in adults, HGH depletion may have as disastrous impact on the body, as it leads to increases in stored body fat, poor muscle mass and even physical depletion of muscles, suboptimal energy levels and exercise capacity, decreased cardiac function and an overall decline in one’s drive and motivation. The psychological changes alone associated with HGH deficiency have been studied to great measure. When HGH levels deplete, adults experience a reduction in their quality of life, energy levels,, sexual drive, and motivation. Will HGH keep me from aging? Don’t be fooled by outlandish claims. HGH will not stop the aging process. In fact, there currently are no procedures or products commercially available that will keep you from aging. However, using HGH responsibly under an experienced, and highly specialized physician’s supervision, can help significantly suppress the symptoms of aging. We only have one life to live – so, why not feel great living it? While women experience Menopause, all men starting around the age of 30, will experience a male form of Menopause, also known as Andropause. Testosterone levels deplete overtime, and inevitably men start experiencing the symptoms of aging.